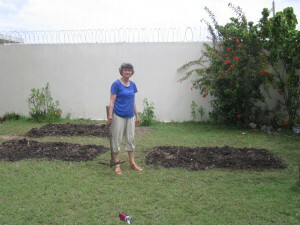 The kitchen garden was dug (three four by eight plots). We learned from the gardener M. Alcindor, who helped out, that the right tool for breaking up the dense sod is something like a heavy pick-axe, which I think is called a mattock. Sweaty work, but very effective. I planted most of it with crops the cook (Mme Dominique) wanted: summer squash, eggplant, hot peppers, tomatoes and parsley. Left a little space for things on the wish list we didn’t have seeds for, and will send later. As a farewell present, just before we left for the airport on Saturday morning, the first squash seedlings were already poking through! 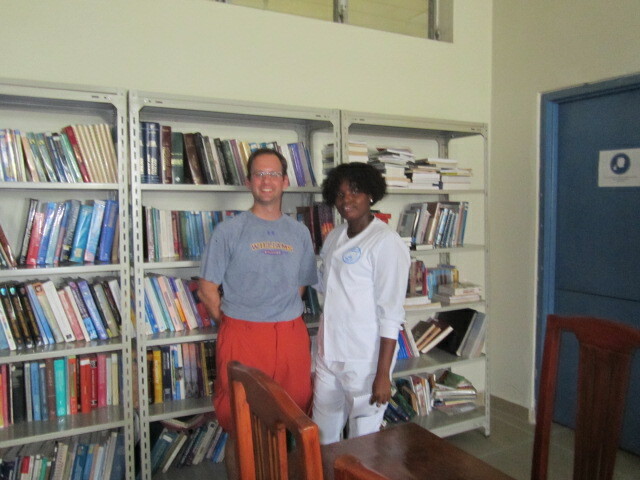 We also (mostly Chris W) also finished organizing the library into sections by topic and language, working with Formelle the nurse/library director. Shelves were cleaned and rearranged as well. It now looks so much better than the ‘before’ picture (attached). Both projects were things that the school had requested, and clearly appreciated. And both provided opportunity to interact with staff and students, and demonstrate that at least these North Americans were willing to work hard alongside Haitians and get their hands dirty (the library work was almost as sticky and dirty as the garden). My biggest compliment of the week was “blan fanm travay” (in Creole to a member of the kitchen staff – I think roughly it means “white woman is working!”). Dean Janet O’Flynn, who is starting an OT program and was very helpful to us, commented as we left that the St. Paul’s team was quite unusual in its attitude of trying to help out with what locals are already doing, we didn’t come with our own notions of what should be done. In a way the garden is a bit of a metaphor for short term mission work – one plants seeds, and has to trust and hope good things will grow, with care from others, after we have gone. Chris with Formelle, the nurse/library director, in front of the shelves to be organized.